!! If you can’t afford a real one, knit your own !! 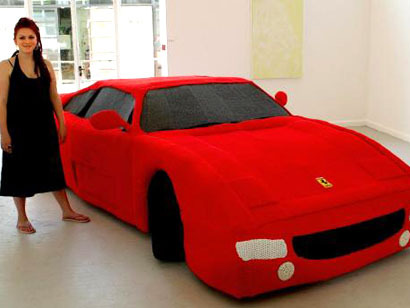 You probably thought I was talking about couture, but in fact I am referring to the Ferrari, that legendary and expensive car from Italy, and some girl in the UK did knit one. Well, what she made was actually more like a big cozy for a steel frame (that she also welded), and somehow she got school credit for making it. It is pretty cool, but where is she going to put that thing? Maybe her parents will give it a spot in the garage. Anything for the sake of art! Be the first to comment on "If you can’t afford a real one, knit your own"